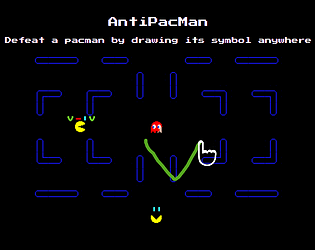 Concept is pretty original but damn, the pacmans are moving fast ! Very clever and inovative. Great job! Pretty cool game , The gesture recognition was a cool addition. The cherries were pretty hard to get with the mouse though haha . Clever, well-made, and challenging in a fun way. Really scratches that "just one more play" itch. wow thats pritty good man! Really awesome man, the game play is smooth. The concept changed my whole view on what goes down when you play pacman lol , poor ghost, they are just trying to survive. ran like a treat on my iPad Pro! Gesture recognition is very good too. Got around 4800 points. I appreciate that the drawn gesture takes on the color of the currently recognized icon.